South Bass Island gets all the action, but it is Kelley's Island where you can go to relax at a slightly slower pace. Kelley does have several well visited watering holes, but for the most part it is residential in nature. The rocky shoreline, pristine beach and quality vineyards make for a fine vacation. The 676 acre state park offers plenty of hiking trails (6 miles) and has a campground with 129 sites. There are also a number of Bed and Breakfasts and cottage rentals. The brand new Kelleys Island Venture Resort recently opened and is the first hotel to be built on the island in almost 100 years. It features 31 luxury suites and a swimming pool. For night life, not all the partying is on South Bass. 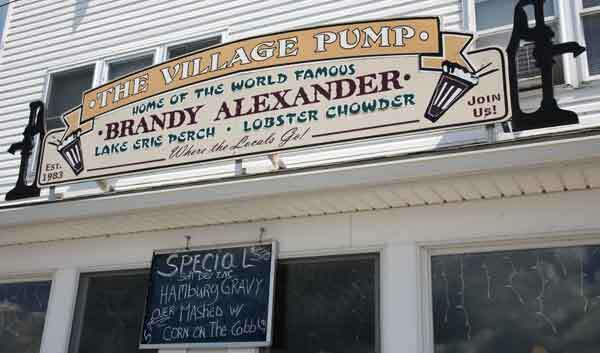 For those staying on Kelley's, make sure to stop in to the Village Pump, Bag the Moon, West Bay Inn and The Casino. Originally called Island Number 6 by the Connecticut Land Company's Survey first made of northern Ohio, then it became Cunningham's Island, named after some eastern landowners, and then it became Kelleys Island. Kelleys Island is the largest island in the western end of Lake Erie and sometimes called the Walleye Fishing capital of the world, Kelleys Island is about 2800 acres with 18 miles of rocky shoreline. The island actually gets its name from two of the Kelley brothers, Datus and Irad from Cleveland (there older brother, Alfred Kelley was one of the early settlers of Cleveland). Irad first came across the island when he stopped there for shelter while sailing to Detroit to deliver some goods from the family store back in Cleveland. When the opportunity presented itself to buy the island, Irad and his brother Datus, put up the money and slowly purchased the island lot by lot. In time they set up a quarry, lumbering, and vineyards. Cedar from the island was used in Chicago to string the first telegraph wires. 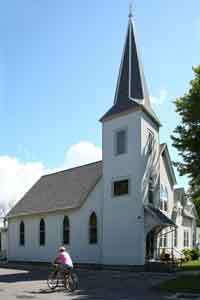 Datus Kelley is buried in the municipal cemetery on Kelleys Island. Kelleys Island, like most of the islands of Lake Erie’s western basin, are made up of vertical and overhanging ledges and cliffs on its north and west shores, and a several broad shelf areas with gentle slopes on its south and east shores. The formations were created by a rise in the bedrock west of the islands. Known to geologists as the Cincinnati Arch, it gives the islands their regional slope toward the southeast. Quarrying in the early years was dangerous work. The Kelleys and other early operators used drills, chisels, hammers, augers, and black powder to hammer and blast their way through the stone. Crews loaded wagons and hauled the stone to one of several docks where it was sold by the cord and loaded onto vessels. The building stone, known as dimension stone, was shipped to Cleveland, Detroit, and Buffalo where it was used to construct churches, homes, buildings, breakwaters, piers, and, in 1875, the first American lock at Saulte Ste. Marie. The photo at left shows men taking a break for the photo, as they load limestone at the quarry. 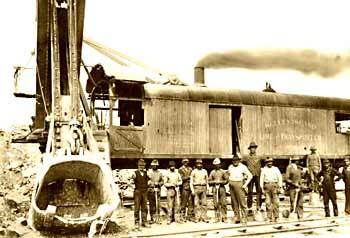 In time the Kelley Island Lime & Transport Company acquired many of the smaller quarries, connected them with a rail network, and mechanized operations. To meet the demand for flux stone used in manufacturing steel, Kelley Island Lime & Transport hired local residents as well as recruiting laborers from Ireland, Italy, and eastern Europe. By the turn of the century, more than 500 men worked at the company’s 16 limekilns located at the North Bay quarry, the cooper shop, and on the wharf. Quarrying limestone still continues on Kelleys Island. In 2004, La Farge of North America purchased the 200-acre Kellstone quarry that can produce more than a 1,000,000 tons of limestone each year. Most is shipped by barge to the Cleveland docks where it is sold as construction aggregate. Today, Kelley's Island is a prime vacation destination that offers a variety of attractions, including several wineries, camping, fishing, boating, and touring island homes and businesses. Kelley's Island is also a prime fishing location. You can ferry your car to Kelley's Island to get around, or rent golf cart's and bicycles. Unlike Put-in-Bay, most of the attractions are spread out around the island, although there is a small central "downtown" area just west of the ferry service area. Next to Kelleys Island State Park, the Glacial Grooves shows the power a moving glacier has even when it comes in contact with solid stone. 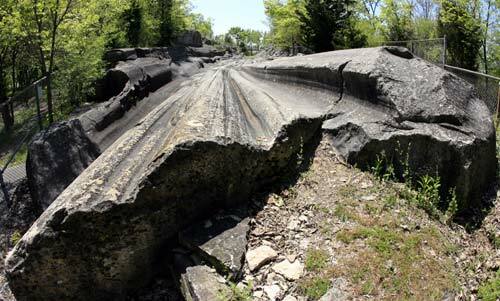 The Glacial Grooves are about 430' long, 35' wide and some 15' deep. The prevailing theory is that the Glaciers gouged and scoured the bedrock about 18,000 years ago and their tremendous weight left deep depressions. In fact, this is how Lake Erie was formed. As the glaciers descended down from Canada, the dug out a large swathe of ground and deposited in lower Ohio. The earth then experienced a period of global warming, melting the large ice flows and filled in the depressions which created Lake Erie. An alternative theory is that the grooves were cause by glaciers, but it was erosion caused by melting glaciers that created the grooves. As the glaciers moved, they picked up tiny pieces of rock and sediment along the way. When the glaciers began to melt, they melted from the bottom out, much the same way that we seen in glacier melts today. Rivers of water flowed underneath the melting glaciers carrying along those small bits of debris that eventually wore away the stone outcroppings. This theory explains why when you look at the grooves on Kelleys Island, the grooves are concentrated into narrow channels. Glacial grooves are in several places in northern Ohio. On Kelleys Island they are a prominent feature on the north side of the island. Many of the grooves were quarried in the 1800s. Fencing now protects the remaining examples of these glacial events. This large limestone rock is on the south shore of Kelleys Island and just east of the historic downtown area. The remains of at least 2 Native American villages were found very near the rock. The 32 x 21’ surface of the rock is covered with examples of aboriginal art. Known as a petroglyph, no one is sure what the unusual drawings mean. The most widely accepted theory is that the large rock was used as a "message stone" where various Native Americans would make drawings noting that they’d been there, how the hunting or fishing had been and/or where they were headed next. Or, the inscriptions were just the graffiti of the day 1000 years ago. Although the rock is sheltered by a roof structure, today, the inscriptions have been almost complete eroded away and very little of the original appearance is visible. In 1850, Captain Seth Eastman, made precise measured drawings in detail of the inscription rock that captured the images that have now disappeared. Ever wonder what happens on Kelleys Island during the winter months? There was a recent article in Lake Erie Living that gave us a good picture of the island during those cold winter months. When the average 70 degree days of summer begin to wane and the fair weather tourists head for home, there's about 100 permanent residents that remain on the island through the winter months. Pre-planning is one major factor for surviving on Kelleys Island through the winter. When the cold comes, so does ice and that means ferry service stops and island residents are on their own. That means supplies have to be ferried over before the lake freezes. There is regular airplane service that brings in perishable items and mail throughout the winter, but fog can be a real problem for personal emergencies when the lake is frozen, as this grounds air service. Everyone seems to agree that the best thing about Kelleys Island in the winter is the serenity and sense of community. Everyone knows everyone else, and there's no crime, no noise, and no traffic. When the glaciers melted some 4,000 years ago, large groups of the northern water snake were left behind and stranded on Kelleys Island. Over the centuries these water snakes developed characteristics that were different than their fellow snakes on the mainland. Today they have their own scientific name: nerodia sipedon insularum. 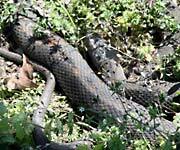 The snakes feed on fish and amphibians, they are not poisonous, and are on the endangered species list. These snakes may be found on several of the Lake Erie islands and after a prolonged absence from Green Island just a few miles west of South Bass Island, the Lake Erie Water Snake has made a stunning comeback. The Ohio Department of Natural Resources along with researchers from a number of universities conduct ongoing studies of the Lake Erie Water Snake. 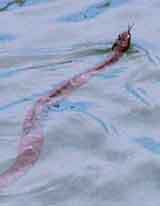 A female Lake Erie water snake that was marked with a Passive Integrated Transponder tag (PIT-see above image for scale) on the south shore of Kelleys Island on 18 May 2001. That same snake was recaptured on Middle Island (a small Canadian island north of Kelleys Island) on 23 May 2002 by officials of the Ontario Ministry of Natural Resources. Two snakes were previously documented to have moved between Sugar and Middle Bass Islands. This new observation further documents occasional inter-island movements by Lake Erie Water Snakes. Researchers are not sure how the snake got from Kelleys to Middle Island; it may have swum or hitched a ride with an unsuspecting boater.